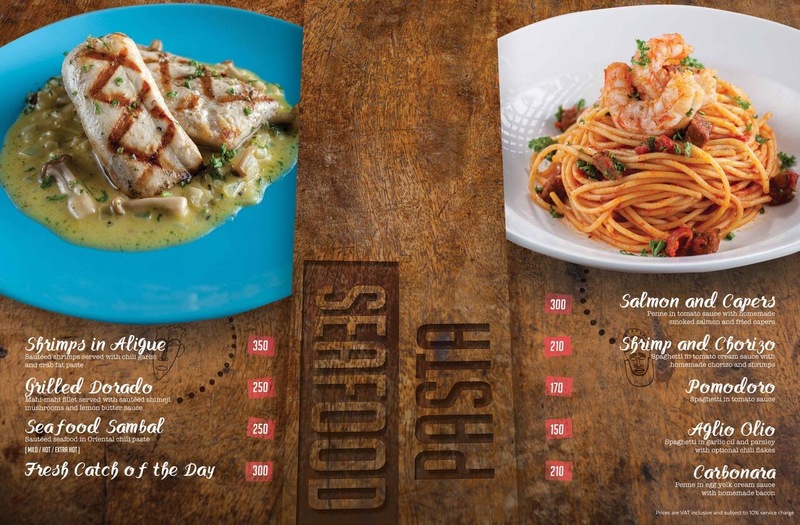 Remember the restaurant owned by Yna Macaspac of ABS-CBN's teleserye Pangako Sa'yo? 13 Ubay St. Comfort Dining was actually the film location of the famous "KusYna". The restaurant is just minutes away from our office, but it was only last week that we got to visit the place for their menu relaunch. While the story of "KusYna" ended, the journey of 13 Ubay St. 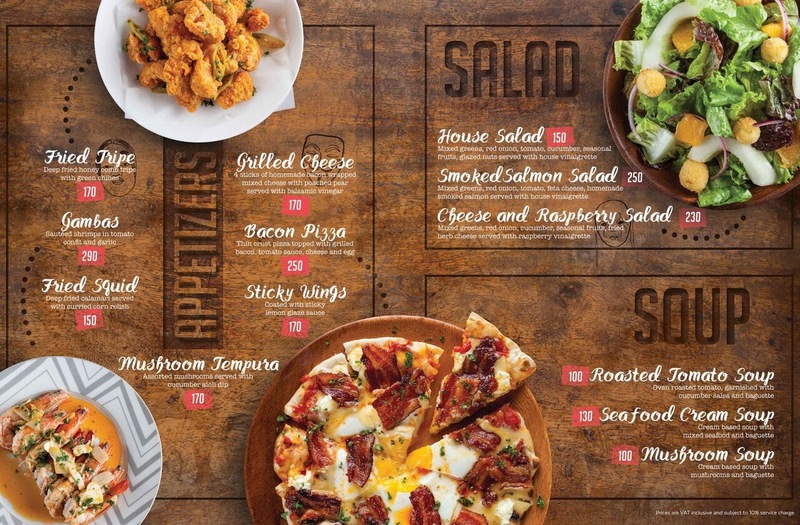 Comfort Dining continues as they celebrate their 1st year anniversary with a new menu lineup. The mother-daughter tandem, Edna and Zaza Sarmiento, took inspiration from heirloom recipes their family personally enjoys, and adventurous dishes from various trips abroad. Filipino cuisine takes center stage on the new menu, featuring Pinoy favorites such as Binagoongan, Kaldereta, Lechon Manok, and Kare-Kare, which are all mainstays at every Sarmiento gathering. 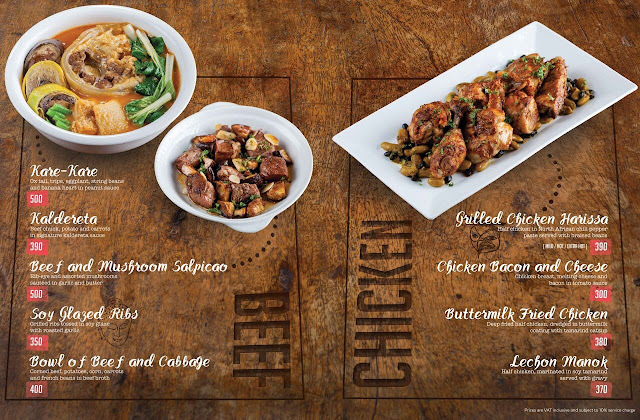 During the relaunch, we were served with both 13 Ubay's bestsellers, and new menu items. 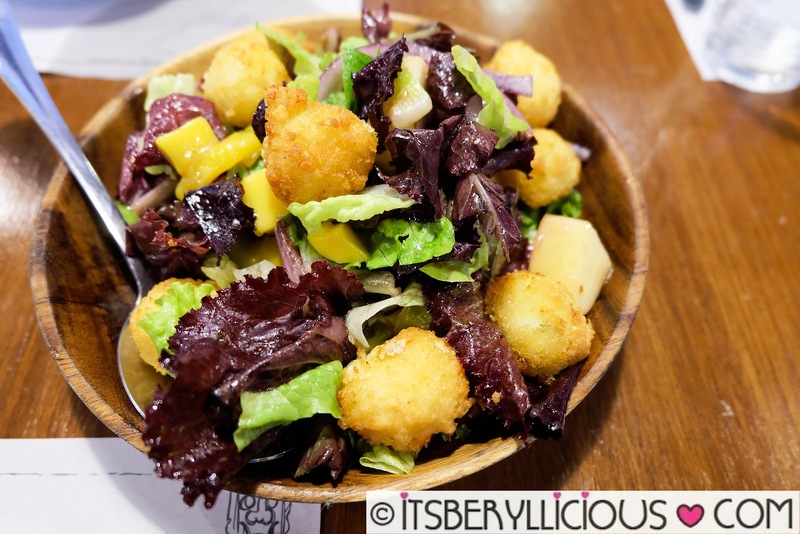 Starting off with a healthy and refreshing Cheese and Raspberry Salad (P230)- mixed greens, red onion, cucumber, seasonal fruits, fried herb cheese balls in raspberry vinaigrette. 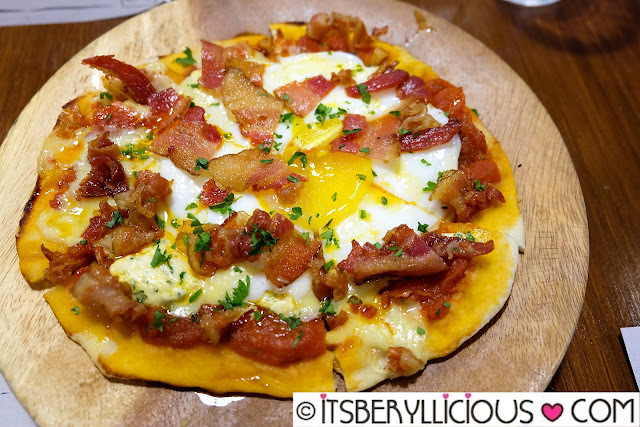 Served next was 13 Ubay's best-selling Bacon Pizza (P250) that highlights their homemade bacon from scratch. The crust was thin and crunchy, topped with generous chunks of crisp bacon and a sunny side up egg. Care for a slice of breakfast? 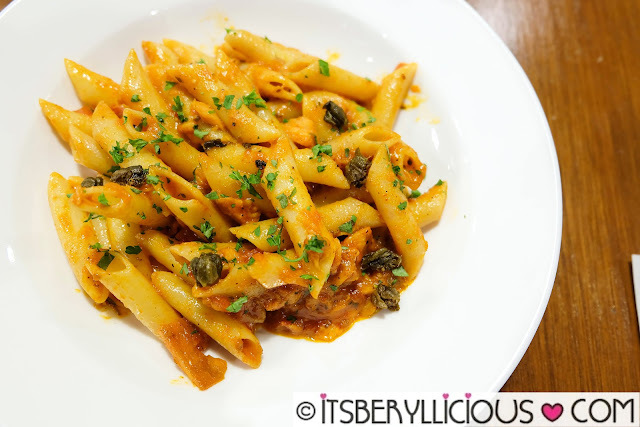 A delightful plate of Salmon and Capers Pasta (P300) was served, before a parade of main courses came out the kitchen. D enjoyed this very much, as we tried to pace ourselves for the succeeding dishes. First on the list for the main courses was the Twice Cooked Ribs (P320) served with a side of apple kimchi. This was really good, however, we found it too salty for our taste. 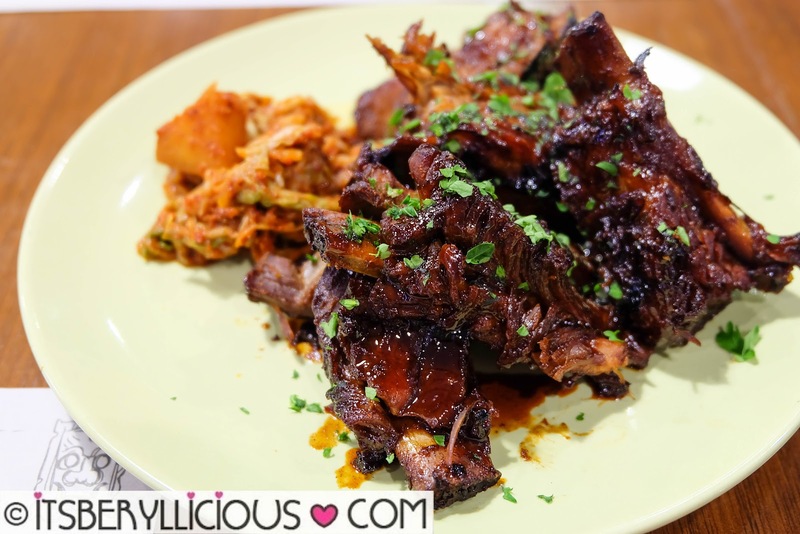 The ribs were tender, not the fall-off-the-bone kind, glazed with tamarind catsup that's best paired with rice. Next up was another bestseller at 13 Ubay- the Grilled Chicken Harrisa (P390)- a dish of grilled chicken seasoned with North African chili pepper paste. 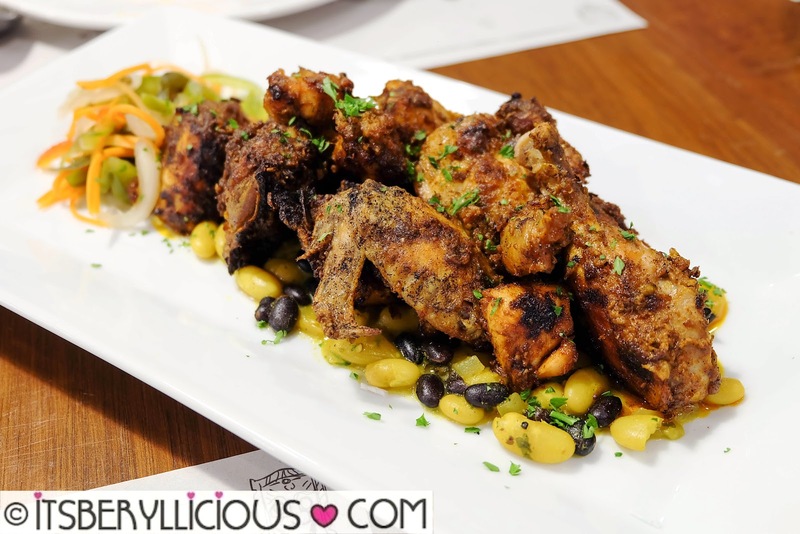 The chicken was juicy and tender, boldly spiced and bursting with flavors. Perfect to tickle your adventurous tastebuds! 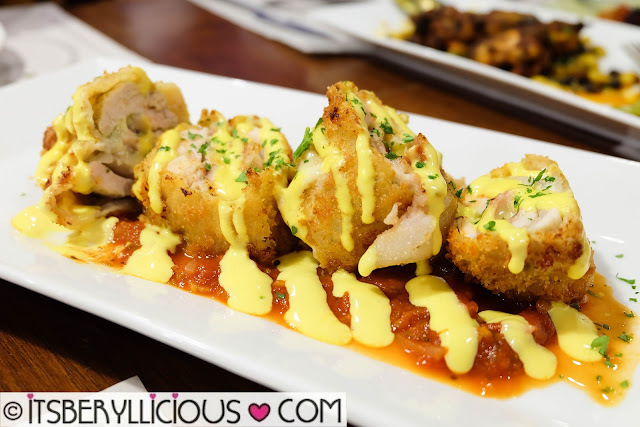 For a more familiar chicken dish, the Chicken Bacon and Cheese (P300) is a nice take on the classic cordon bleu- deep-fried chicken breast roulade with bacon and melted cheese in tomato sauce. 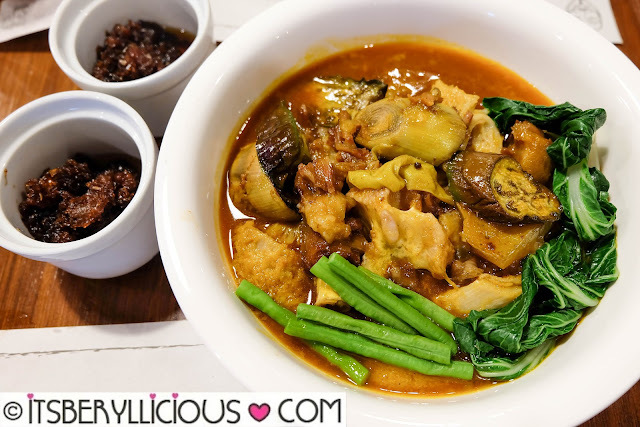 Ms. Edna Sarmiento takes pride in their version of the classic Kare-Kare (P500). 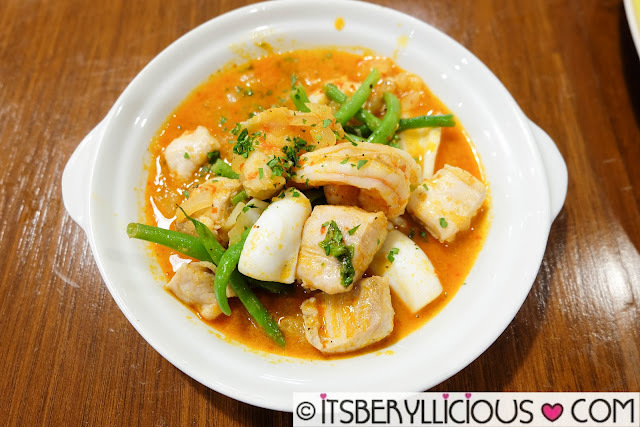 It has all the staple ingredients like ox tail, tripe, eggplant, string beans, veggies, and banana heart, but the peanut sauce didn't have the usual thick and rich consistency that most kare-kare have. 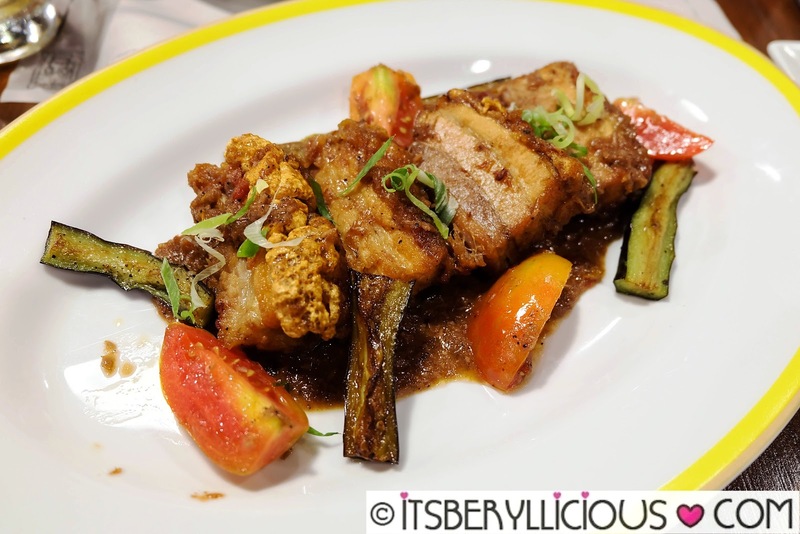 What we loved about this dish was the sweet-style homemade bagoong, which although not too salty, complemented the dish well. While I love my bagoong sweet, I personally liked this salty and savory Binagoongan (P320) the most. The pork belly was crispy and tender, with just the right amount of fat trimmings in between. Although we were too full from everything we had, the Seafood Sambal (P250) was still enjoyable and delightful to the palate. 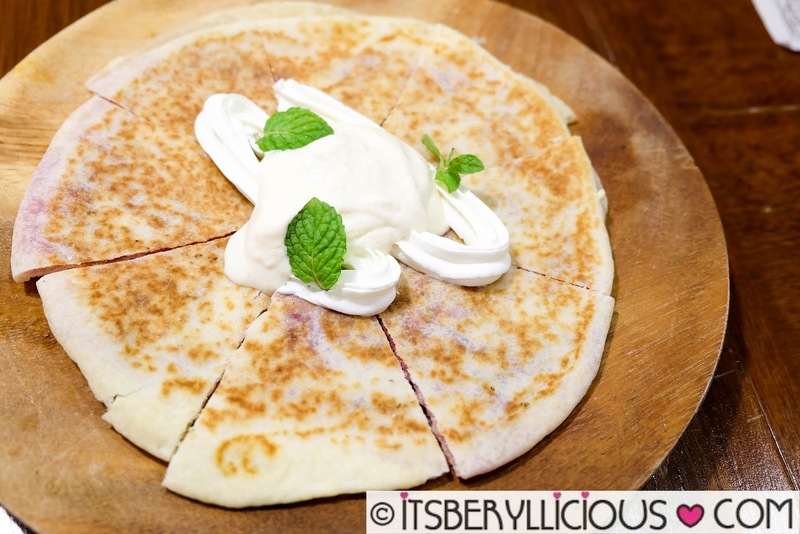 A surprising discovery was this Ube Piaya (P170) that showcases Ms. Edna Sarmiento's homemade ube halaya. D, who has never eaten piaya before, liked it very much as well. 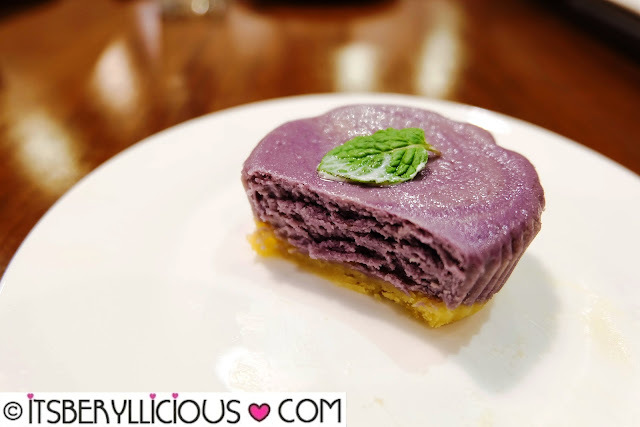 The same ube halaya is taken a notch higher with their Ube Cheesecake- homemade ube cheesecake with polvoron crust. We were given samples of the bestselling dessert in a cupcake version during our visit, and everyone raved about it. 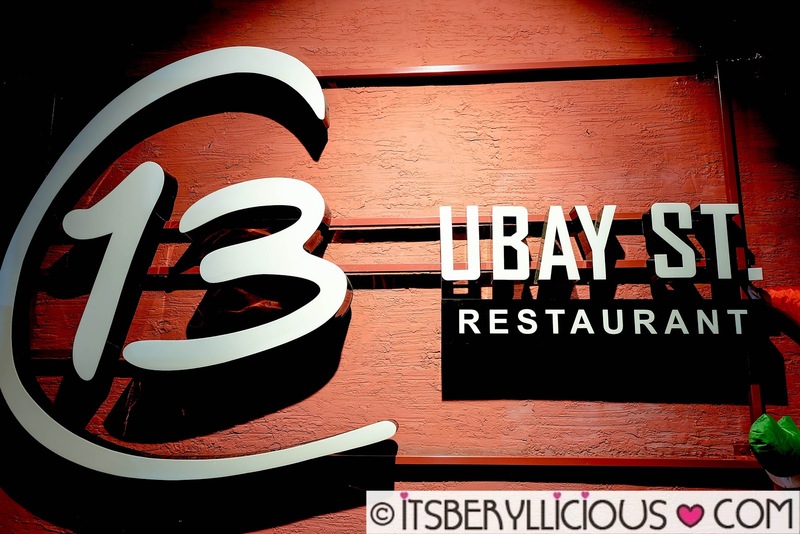 Another must-try ay 13 Ubay! 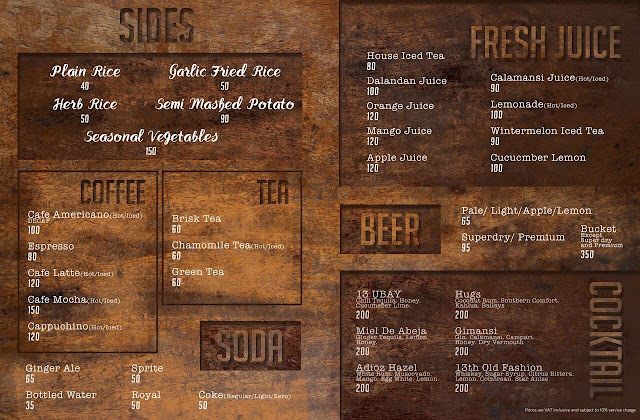 Visit 13 Ubay St. Restaurant for some delightful comfort dishes in a casual and homey setting. 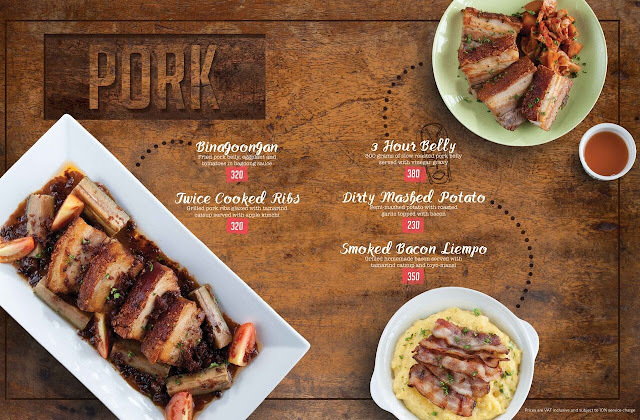 This hole-in-the-wall restaurant may be off the beaten path in the bustling neighborhood of Banawe, but the trip is definitely worth it! 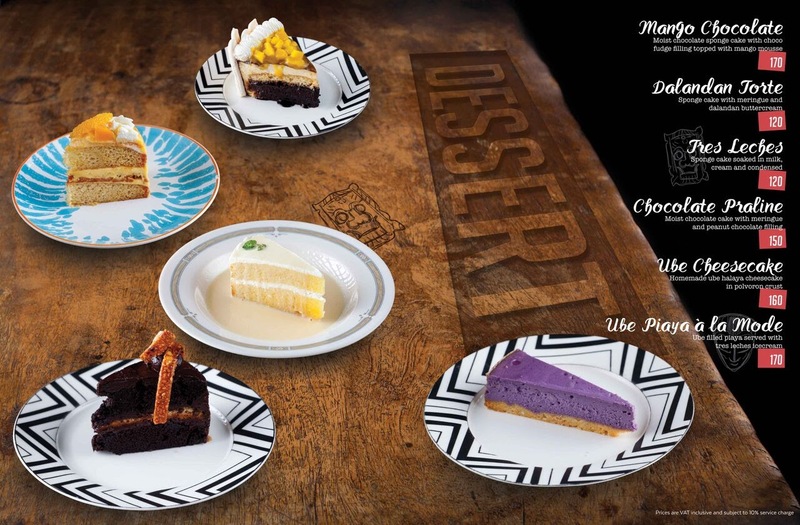 My personal favorites were the Cheese and Raspberry Salad, Bacon Pizza, Binagoongan, and ube halaya desserts.